The next big worries putting pressure on the markets are the presidential election and the inevitable rise in interest rates. Some would argue that these headwinds are ultimately linked by politics. Although Republican nominee Trump may be the most unpredictable wildcard of all-time, we know from past Fortis letters pertaining to short-term volatility that “You got to lose to know how to win…” as legendary Aerosmith lead singer, Steven Tyler, would wail. Rewind the clock about 250 years. Even then, our country’s Founding Fathers were planning for elections involving candidates much worse than the Donald and Hillary when they set up the checks and balances system of this great republic. We expect a lot of media coverage, dissection and bar talk after Monday’s debate, followed by market volatility. But, let’s stay disciplined and look at history through the lens of our two apparent market threats—elections and rising interest rates. Both threats will certainly cause short-term instability, but they won’t be enough to change the business cycle dramatically in the near term. Remember, bear markets are caused by three things: recessions, global conflicts, and credit bubbles–not Presidential elections. But, that will be the topic for another Fortis letter. There have been eight rate hike cycles going back to 1976 in which the Fed raised rates a minimum of 3 successive FOMC meetings[HB1] . The shortest cycle was nine months and the longest cycle was 39 months. If you held a diversified portfolio consisting of 30 percent U.S. stocks (i.e. S&P 500), 30 percent global stocks (i.e. MSCI) and 40 percent Barclays AGG aggregate bonds you would have earned 8 percent [HB2] annualized on average during the aforementioned cycles. Of the eight rising rate periods since 1976, there has never been an instance in which a diversified portfolio producing a negative return—that’s right never. One year up to the rate hike +18.1% vs. +11.6% historical average[HB3] . One year period following the final hike of the cycle, the S&P returned +14.6%. During the rate hikes, stocks tend to perform worse than average, but still manage positive returns. AGG gained on average +11.4% in the 12 months after the rate hike cycle ends. AGG returned 2.5% during the rate hike cycle. In only two of the eight cycles did AGG have negative returns. In the one-year period leading up to rate hikes, the MSCI EAFE Index delivered an average return of +25% vs. a historical +11% during rolling 12- month periods (not leading up to a rate hike). 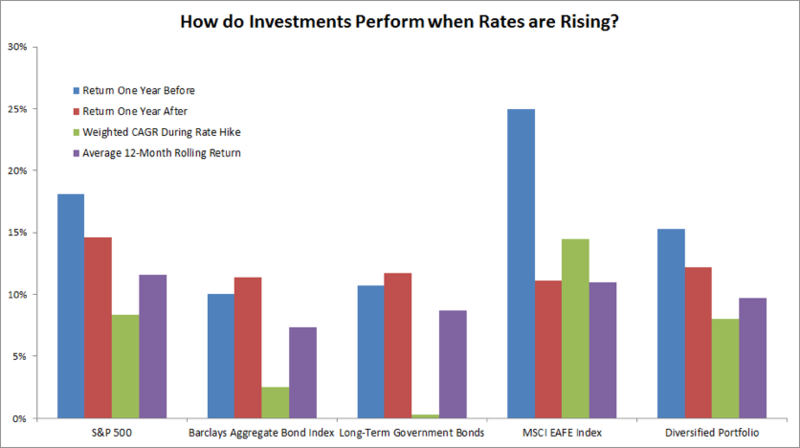 During rising rate periods, the EAFE index posted a 14.5% average compound rate of return. In the year following rate hikes, foreign stocks returned +11%. Fortis avoids making short-term based decisions on current events. You should be intellectually focused on the presidential elections, but we would not recommend making investment conclusions based on your favorite party or candidate. 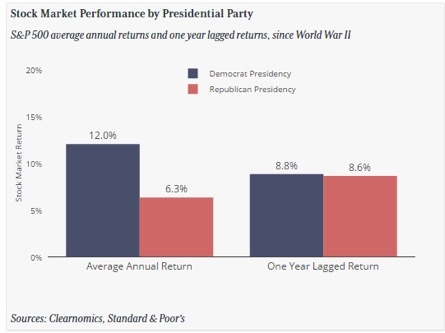 As you can see in the chart below, one-year lagged returns for the two major parties are almost identical. 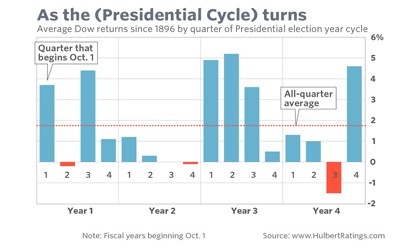 Here is an image of the the Presidential cycle, an imminent threat is not supported by historical data. As most of you know, we encourage intellectual engagement at Fortis. The upcoming election and the interest rate cycle are certainly worthy of your attention and due diligence but we would not recommend making major portfolio decisions around “what if” scenarios. Let’s stay focused on a potential bear market caused by global conflict, recession or credit bubbles. Almost everything else is just short-term noise. We are more concerned about the Deutsche Bank crisis right now that we are about the Trump vs. Hillary debates. A collapse of the venerable German banking behemoth would cause unknown ripples throughout the global economy. But for now, we stay the course.